Not everyone can be a on a beach 24/7, bathing in the sun. But self-tanning has come a long way and is a great alternative to the health risks of tanning beds & sunlight. It gives you the perfect tan that you are looking for. Here are some general tips to getting the desired look without the streaks. 1. Exfoliate your skin before a session of tanning. By removing dead skin cells, you are going to allow only new cells to surface. With a fresh cells at the surface, the tan will not only stay longer but will look better. 2. Wax/Shave/Epilate before instead of on the day of. The tan won't look so great if it's on red, irritated skin. 1. Make sure that dry areas on your body are moisturized. Dry areas do not absorb the product as well and will give uneven results. Go for a body oil instead of a regular lotion. 2. For a wonderfully even tan, apply the product on center of a big kabuki brush. Buff in the product using the brush on the area which you wish to tan. Make sure that the hairs of the brush are synthetic, so that they will not absorb any of the product. Just like in makeup, blending is the key! 3. 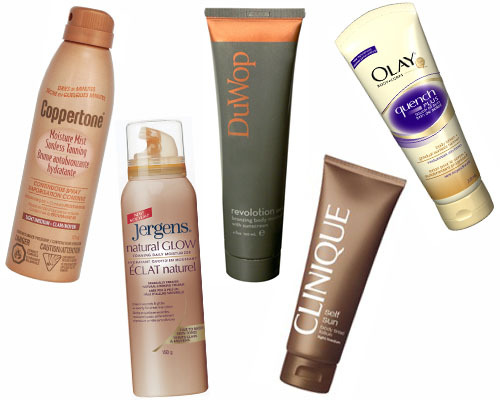 If you feel that the product is too tan for you liking, you can soften it up by adding moisturizer. Using your favorite lotion, add it to the product in a 1 to 1 ratio. Apply the product on a desired area and then apply the lotion right on top. 4. If you end up with dark blotches, take a shower after the tanner has finished developing. Scrub the dark blotches gently, this will remove some of the color for an evened look. Apply moisturizer and repeat the process in 24 hours if you are not satisfied. 5. If you are tanning for the first time, use a product that has a very low DHA. Do two to four applications over the course of a few days until you get your desired look. This will help you avoid looking too "tan" that it's obviously fake. 6. If you wind up having a few streaks, cut a fresh lemon in half & rub it over the streaks. Yor can also use baking soda with water, if your out of lemons. Massage it into the streaks, and voila! No more streaks! Hope you'll enjoy your next session without (fingers crossed) any streaks!